Confessions of an ADD English Teacher: Organization challenge update! 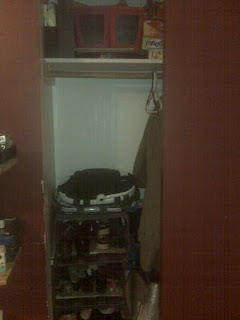 Things are going well for my challenge in organizing my front closet. Not only am I making progress, I'm doing it on the cheap! 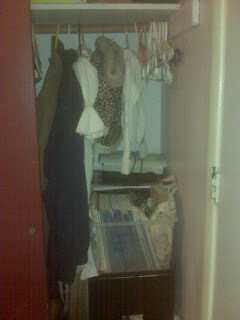 And it's inspired organization of a couple other areas of my house. . . on a BUDGET. The closet is going to cost me a total of $2. For plastic baggies from the dollar store. Everything else is repurposing things I already have around the house. And throwing things away. Lots of things...I had a queen sized air mattress in the closet. I pulled it down and discovered the valve cover is missing! And I still have this because???? I set it aside to see if D knows where the cover is. If not...it's going in the trash. Also in to the donate pile: four of those joystick games you hook up to the TV. Since we got a wii, the kids haven't played with them. They get tangled and knocked out of the closet, I don't know how many times. I am pretty sure the kids will never miss them. I also found about 50 mylar valentines balloons that have never been used. Why? Two or three years ago we were in charge of decorating for our church Valentine's party. I got the balloons off freecycle and these were the leftovers. GONE. We also only had half the cards for memory and less than 1/4 of the cards for Sorry. It's still a work in progress. I am trying to decide if I need to find a new home for the workbooks or if they are ok on top of the file cabinet. The file cabinet has a lot of D's school papers in it and I'm happy it's hidden away in the closet. The shoe situation...I don't think there's a really good way in a small home to store shoes for 6 kids. If the shoes go in the kids' rooms, they get lost. BTDT. So for right now, unless someone has a brilliant small scale option for me, the milk crates stay stacked. Besides. the milk crates make a great place for me to store my picnic baskets. At least those collapse. I love how the game storage worked out. I found these baskets last year in the discount bin at the grocery store. They were $1 each, I think. 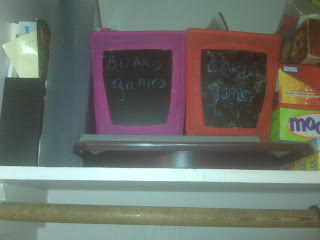 With a chalkboard on the front for easy labeling :) We have them labeled for board game pieces and card games. The boards for the games stored easily in one of those plastic cereal box storage containers (again picked up from the discount bin). The kids lost the lids ages ago but I kept them hoping to find a good use. I think D is going to be pleasantly surprised with the progress I'm making. Now that the closet isn't in danger of randomly killing people, I'm hoping he'll be motivated to actually fix the doors so the closet will be very functional. I'd also love to hear suggestions for any improvements I can make. I'm thinking of storing the boards for scrabble and blokus on their sides, but for now they are under the baskets. yeah, that didn't work for the kids. Too many shoes.